Morpheus is a Radio Frequency Microneedling treatment that stimulates collagen by targeting the deeper layers of the skin. It is the first and only full-body fractional technology to morph the aging face and contour the body. The triple action of fat coagulation, connective tissue contraction and bulk heating provides a device with minimal downtime and maximum results. This Radio Frequency Microneedling devise penetrates deeper than any device on the market today. It has a 4mm thermal profile, whereas the competitors are only 1-2mm. The micropins are gold coated which allows heat to reach the deeper layers, with little to no thermal damage to the dermis. The advance design allows for and an extremely uniform effect and is safe on all skin types. Morpheus can be used on almost any area of the body that can benefit from skin tightening and adipose remodeling. The most commonly treated areas are the face and neck, however any area of the body with sagging skin, poor skin texture or stretch marks can benefit from this technology. What is involved at a Morpheus consultation? When you come in for your initial consultation, you will meet with one of our Certified Medical Laser Technicians. We will discuss your goals with you and examine you to determine if you are a good candidate for the procedure. They will discuss details of the procedure including how many treatments it may take to achieve your targeted results, show you before-and-after photos and answer any questions you may have. If you choose to have the Morpheus performed, you will schedule to come back for the procedure. Typically Morpheus procedures are not performed the same day as your initial consultation. How do I prepare for a Morpheus treatment? Once you have met with one of our Certified Medical Laser Technicians and choose a date for your Morpheous8 procedure, you should plan for your care and recovery. Plan to take one to three days off work after this procedure, depending on the type of work you do and the depth of the treatment. Our team will assist you in determining how much time you will need to take off at your initial consultation. If you smoke, you must quit a minimum of three weeks before Morpheus or any of our devices. Smokers heal more slowly and can have wound healing problems. You will arrive one hour before your scheduled procedure time. Your technician will apply a topical numbing medication to your face. You will be waiting here with the numbing medication to take affect for about an hour, so please bring something to read, knit, surf the internet, etc. After about an hour we will bring you back to the procedure where your technician will make final preparations for the procedure. The topical numbing medication will be removed and the Morpheus procedure will begin. The Morpheus procedure takes about thirty to forty-five minutes to perform. After removing the topical numbing medication, the technician will clean your skin. The procedure involves a device that allows tiny microneedles to penetrate the skin to 4mm. Once these microneedles are inserted, radio frequency is used to deliver heat energy to the deeper layers. This happens in roughly a second and the process is repeated over the entire area for treatment. After the procedure, cool compresses are applied. We will apply a physical block sunscreen and you will be ready to go home and relax for the remainder of the day. What should I expect after a Morpheus procedure? Visible results can be seen within a few days, but typically after three weeks the most noticeable results appear. Improvements continue up to three months after treatment. Since patient downtime is minimal, makeup can be applied one to two days after the treatment. You should expect to see micro lesions a few days after treatment and slight redness for up to one week depending on treatment parameters. You should moisturize the treatment area and avoid direct sun exposure. It is also recommended that patients use a good, broad spectrum sunscreen every day. Our team will give you product suggestions for maximal results. What are the benefits of Morpheus? This Fractionated Radiofrequency technology is a scientifically proven method to reduce wrinkles and rebuild collagen and fat. It is minimally invasive, using a matrix of micro pins to renew deeper layers of the skin with almost no patient downtime. The benefit of Morpheus’s color blind technology is that it can be used on all skin types. The unique properties allow even darker tones to be treated. What are the risks of Morpheus? Morpheus has risks, and it is your personal decision whether benefits outweigh the risks. Common risks include redness or swelling, hyperpigmentation, hypopigmentation, uneven skin tone/texture and the need for additional procedures. Most of these are temporary. There are also more uncommon, complicated risks, such as scaring or burning of the skin. 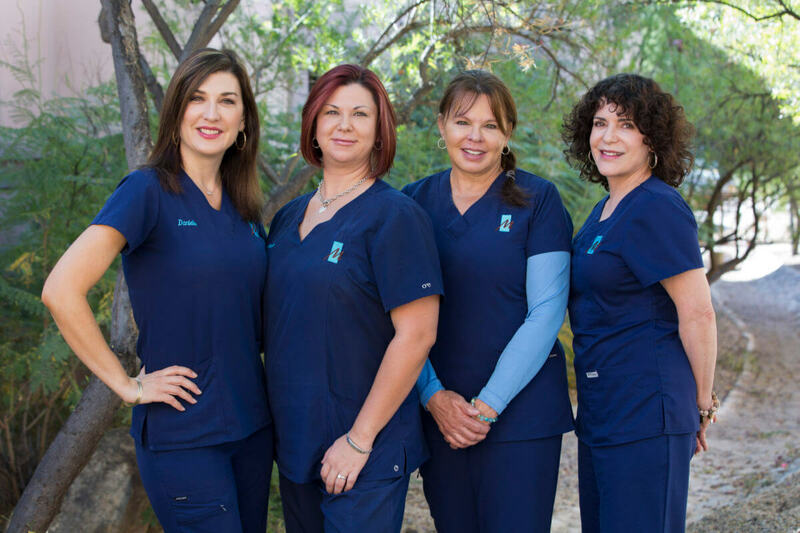 Dr. Maloney has some of the most Highly Qualified and Experienced Skin Care Specialists in Tucson.